Programmable AC controller for aircraft and helicopter models. 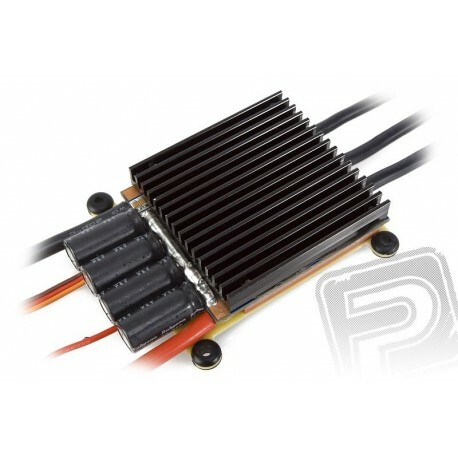 Continuous current 120A (peak 150A), power supply 18-38NC / 6-12 LiPO cells, weight 145g, dimensions 55x72x17mm. The programmable microprocessor controller with increased supply voltage range for AC motors without sensors ( "brushless, sensorless") designed using the most modern semiconductor technology options with excellent usability features while maintaining a simple and user-friendly service. Used to control the speed of AC motors in model aircraft for the supply of NiCd / NiMH and Li-poly / Li-ion / Li-Fe. The power of the controller is electrically isolated from the control electronics to ensure high resistance to interference at high operating current and high voltage supply. 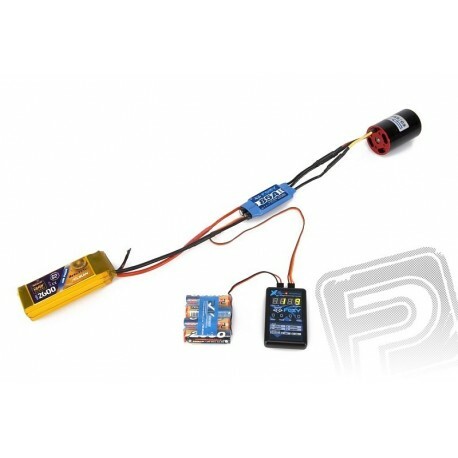 The controller is equipped with a stabilizer supply for receiver and servos. For easy configuration of the controller is a special programming card FOXY Card with four-digit LED display, which is sold separately. Extremely low internal resistance thanks to a new generation of power MOSFET transistors. Suitable for the vast majority of AC motors. Galvanically separated above the power section using the optoelectronic component. It can operate with receivers Power 4.8 to 8.4 V (4-5 Article. NiCd / NiMH 2S LiFe, LiIon, LiPo). Advanced Governor Mode (constant rotor speeds) for helicopters. Adjustable timing for optimally matched to the engine. Adjustable Circuit PCO - disconnecting the motor at a supply voltage drop. Safe switching (prevents engine starts when you turn). Overload protection (when the temperature reaches 110 ° C controller performance is reduced). Perimeter to prevent sparking when connecting the drive controller. Automatic download of gas at the control signal is lost. Continuous linear regulation of gas. Span gas for the perfect fit control signal from your radio control system. Programmable brake (off - on three levels nastavuitelnými braking intensity). Optional battery type (Li-Poly, LiFe or NiCd / NiMH). Resetting the controller settings to factory default settings. Adjustable governor mode (maintaining a constant rotor speed for helicopters) or three adjustable modes with soft start for helicopters to control the engine speed via the throttle curve. Adjustable soft start (for motors with gearboxes and helicopters) in nine stages. Adjustable way to disconnect the motor at a supply voltage drop (derating or immediate disconnection). Thermal overload protection: if the controller temperature reaches 110 ° C, the regulator begins to limit output power to reduce its temperature. Protection against loss of control signal: the controller automatically disengages the engine when the control signal recorded a loss of gas more than 2 seconds. 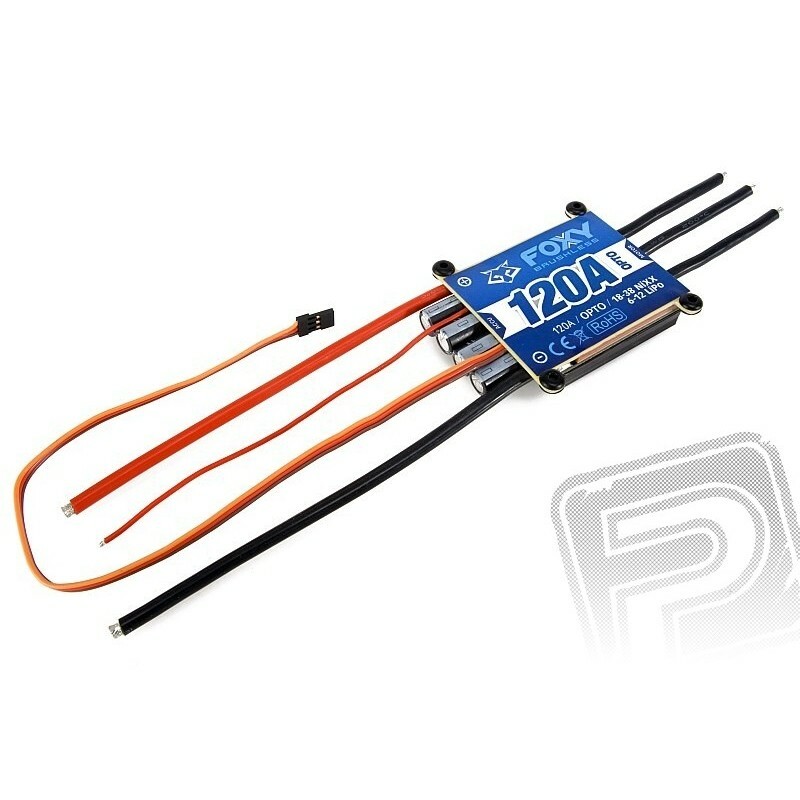 Spark protection when connecting the drive battery: When wiring, proceed as follows - first connect the negative pole (black wire) and then the positive supply voltage (red thin wire), and finally the power conductor to the positive supply (thick red wire).